Thought I’d share another meal of ours this week. These taco’s have become a staple in our house. We have these about once every other week. Even my picky eaters will eat this meal without fussing. It’s also quick and healthy. My taco shell cracked in half so you can actually see what it looks like inside. So scrumptious! In a large skillet cook beef, red bell peppers, onions, chili’s over medium until meat is no longer pink. While heating beef mixture prepare taco shells (or pitas) in oven (follow directions on taco package for heating – typically takes about 6-8 minutes to heat on 325). Once meat is cooked add beans, corn (still frozen), taco seasoning package (with the brand I use, I just dump the dried taco seasoning in and add 2/3 cup water – follow the directions on the package), about 1 cup of the Mexican cheese blend and all remaining seasonings. Stir thoroughly. Once the water from your taco seasoning has thickened your taco’s are ready! 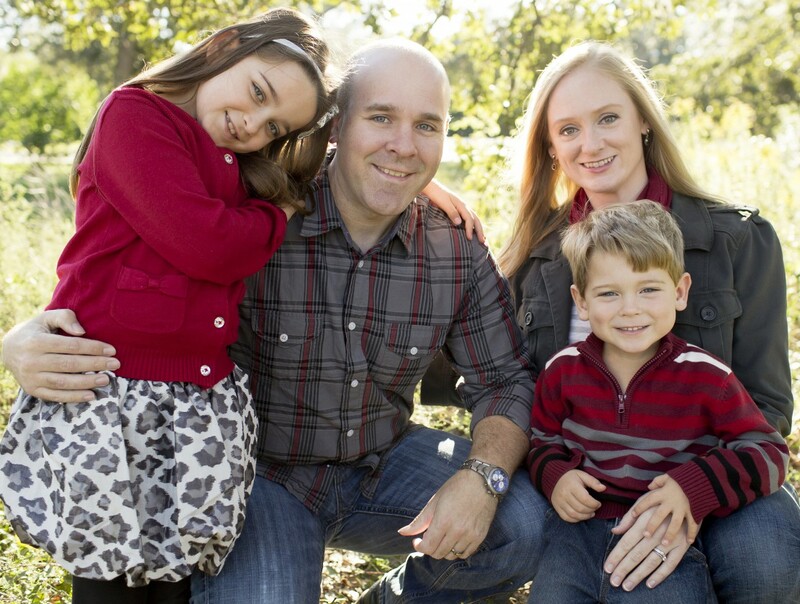 This takes just a couple minutes once everything is stirred up. Pile your taco as you like. 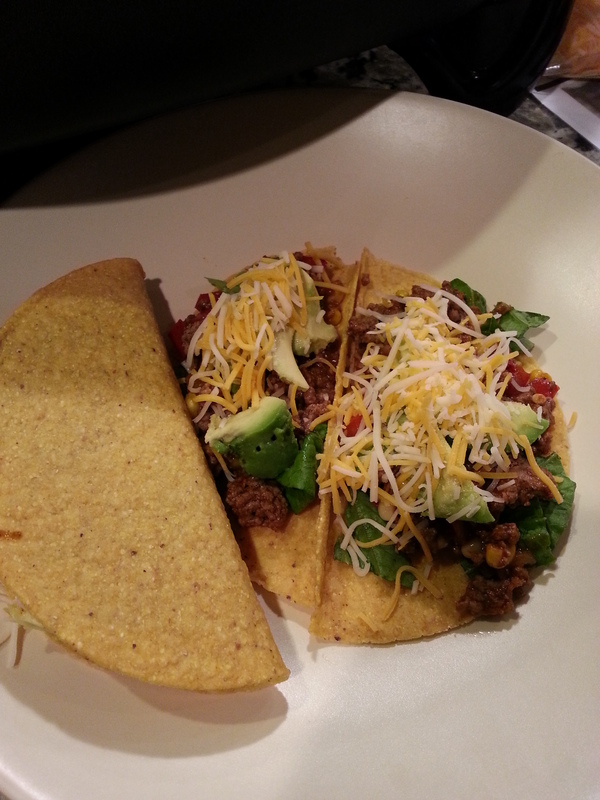 We typically put romaine lettuce, then the beef mixture, avocado slices, then cheese. This takes about 15-20 minutes to make. Skip the taco shell or pita all together for a super healthy and carb free meal by putting the beef mixture over a bed of lettuce. It’s a great taco salad too. This recipe makes enough for 4 of us plus 2 left over meals. I love bringing the left overs to work with me. I heat up the beef mixture and then throw in my lettuce. Apparently, when I was menu planning for this week it was all about the Mexican food. 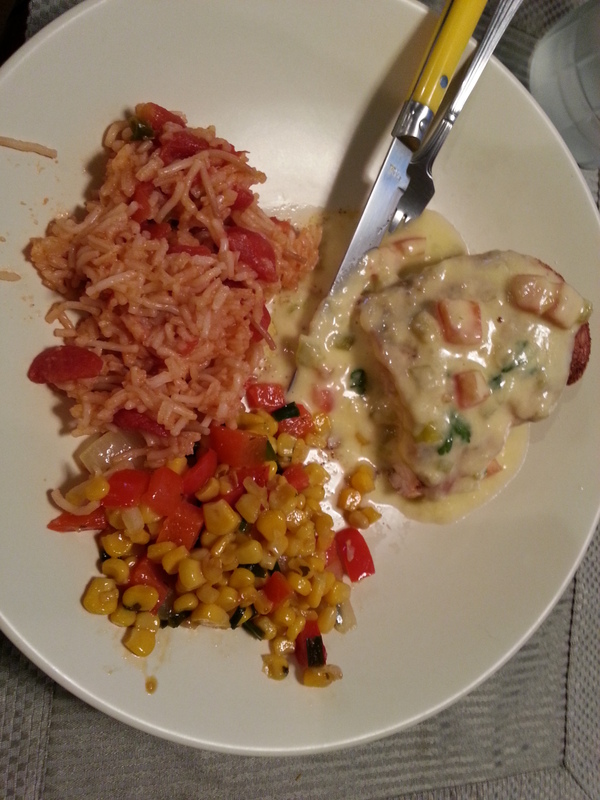 Last night I made chicken covered in queso, spanish rice, and a bell pepper and corn mix. Again, ignore the awful pics. Its all about the food! I always tenderize my chicken by placing it between 2 sheets of saran wrap and beating it to death! Ha! Really, this makes it cook so much better and faster. While tenderizing and seasoning heat up butter and olive oil in a skillet or grill. After tenderizing liberally sprinkle the fajita seasoning. Once your skillet is hot put chicken in and cook till done, flipping half way through. You can eat the chicken as is and its really good. 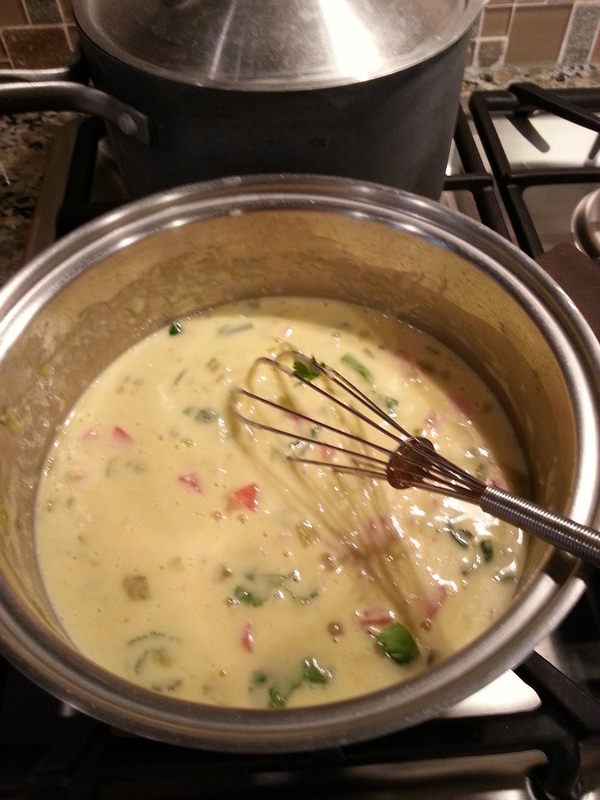 It really doesn’t need anything else and is a bit healthier, but for more flavor add the queso. Follow this recipe and instructions from Annie’s Eats. Once made, just spoon on top of chicken. The only thing I changed was instead of jalapeno’s I put in mild canned chili’s because I don’t do any kind of spicy. But, if you like spice add the jalapeno’s. Heat skillet or pan with butter and olive oil. Once heated stir in the green and yellow onions for a couple minutes. 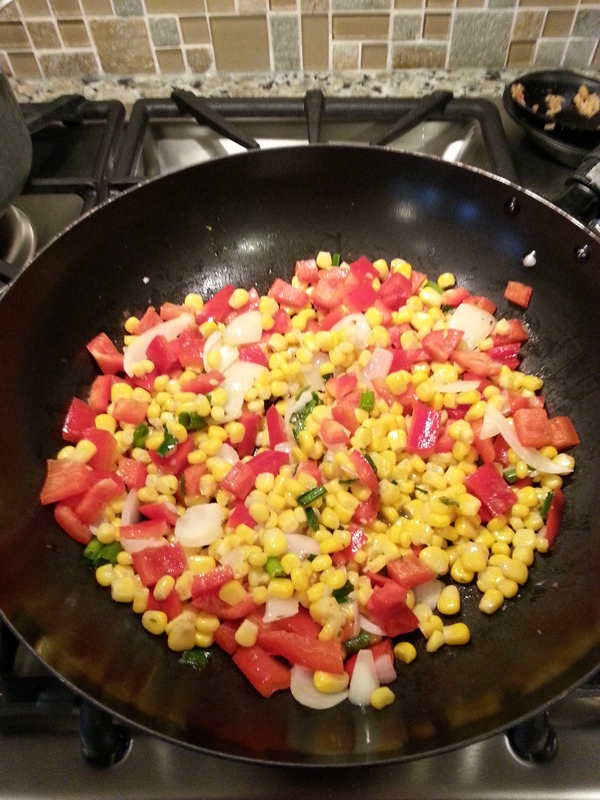 Then add the corn and bell pepper and heat until at the crispness you like. I heated mine for about 10 minutes on medium heat. Then I add box spanish rice. This is certainly not a fancy meal, but very yummy and full of flavor. I made the best Southwest Chicken salad ever yesterday! The original recipe is here, but I did add a couple things to mine and used my go-to cilantro lime ranch sauce instead of the one mentioned in this recipe. Pardon the awful cell phone pics…I don’t claim to be a foodie photographer. This is what was left after we ate ours. I forgot to take pics beforehand. This makes a good amount and we had enough for 2 more meals as leftovers. I also kept my chicken off to the side and added that separately, but you can just throw it all in there together. For your salad – Shred or cut up your rotisserie chicken in bite sizes. Then cut up your fresh romaine in small chunks (or tear them – I find that to be faster), cut up the tomatoes, onions, bell pepper, and avocados. Rinse and drain your black beans and corn. I also then place them on a paper towel to further get rid of as much moisture as possible so your salad isn’t soggy. Combine all your salad ingredients and toss, including your shredded Mexican blended cheese and tortilla strip chips. 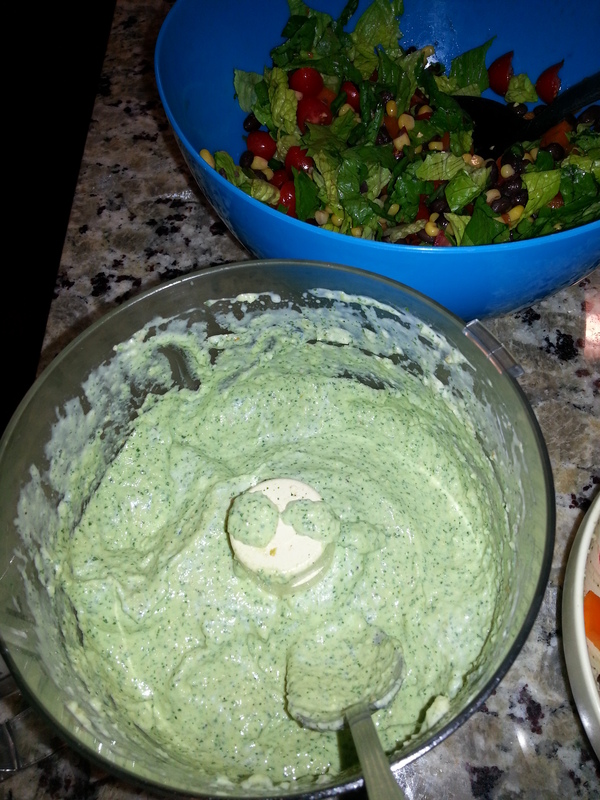 For your dressing – Combine all ingredients in a blender/food processor and blend until creamy. This makes a huge batch, but is great on grilled chicken, used as a dip for taquito’s, and you can even freeze it. To thaw it I leave it sitting out or put it in the microwave on defrost. Stir with a whisk or put it back in the food processor to get it to that perfect creamy consistency again. It still tastes great! 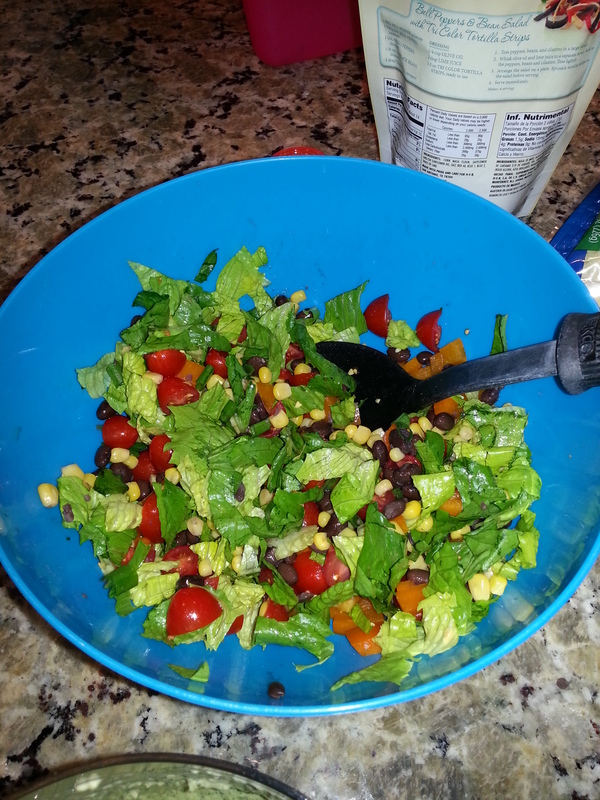 **Top your salad with a couple spoonful’s of the dressing and you’re good to go. Quick, easy and relatively healthy meal. Its super filling too.